The sketch this week's Friday Sketchers is deliberately simple and Carole has invited people to add text and embellishments as wished. 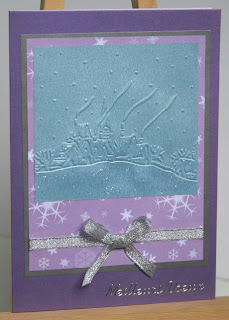 I've kept it simple and hopefully let the embossing, Cuttlebug Winter House, steal the show. I've discovered a Cuttlebug Challenge blog too. 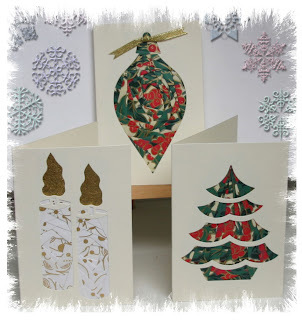 As I can't use Provocraft's designs for cards I sell via shops, I don't use the bug as often as I might but love it this time of the year for personal use and selling direct. With so many Christmas markets coming up (and I've turned down several !) I've got to keep cards relatively quick at the moment. Big thanks for your comments: They are very cheering among the rainy weather. I shall be blogging more when I can grab some time. 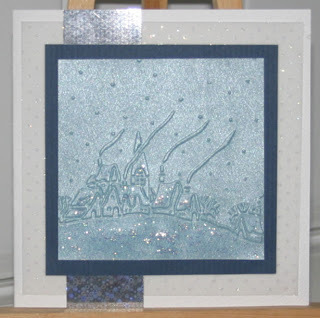 Used: glittered dotty vellum, patterned silver card, navy card, and holographic glitter on the shiny blue embossed image. Among several cards made today, I have managed a 2 in 1 on this week's challenges from Spoon full of Sugar (Michelle's sketch) and Paperminutes challenge to cut out the image: The vellum base layer and piece of DP are Papermania; the image is Whiff of Joy water-coloured with metallic gel pens: I add colour to the edges and draw it in with a wet/aqua brush, adding more colour or high-lighting as I go. 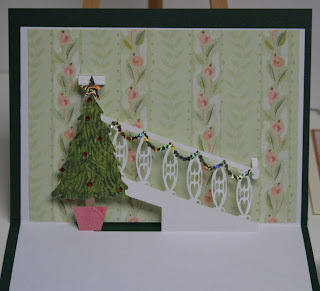 A card just using the Lace Tree Cuttlebug embossing folder, my eazi-score board for the parallel lines, an adhesive gem and peel-off text on pearlescent card. Quick and simple but effective I think. Voici une carte où j’ai utilisé seulement le classeur de gaufrage Cuttlebug ‘Arbre avec ornements’ (embosser sec) avec une petite pierre et le sticker texte. J’ai utilisé ma planche ‘Eazi-score’ pour les lignes embossé pour le texte. 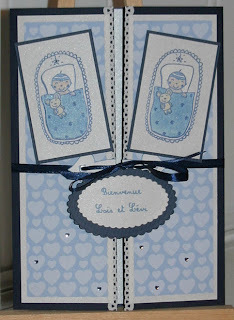 This is a quick request for a card for twin boys. 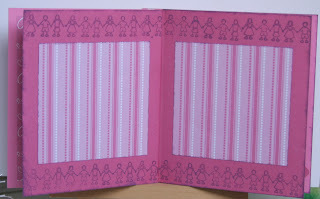 The inside is lined with the same pearly paper used on the front and stamped in two corners with a bow and 2 bibs. Voici une commande pour une carte rapide pour deux garçons jumeaux. Excusez-moi je n’écrit pas en français souvent. Bien sûr c’est plus difficile pour moi et il me prend plus de temps. Tous les marchés de Noël prennent mon temps en ce moment et j’ai besoin de faire plusieurs de cartes et des autres choses. J’ai moins temps pour mon blog. Si vous êtes dans les environs de Finistère sud, me direz ‘bonjour’ dans un marché. Aussi je ferai deux ateliers de mini-album à St Yvi pour le Téléthon. Si vous avez intérêt m’envoyez mail (voyez mon ‘profile’). 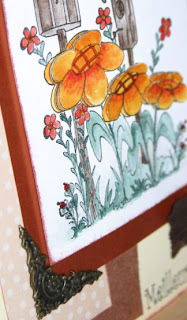 are STILL having their one-a-day giveaway: Not that I'm greedy or anything but they are lovely stamps! And there's only 5 days left of November now! And Christmas is only a month away!!! I had a great weekend at Chateaulin's Artisan'Arts marché de Noël selling lots and seeing the wonderful variety of other people's artistic creations. I like to demo at these events and one of the things I made was this little suitcase with the 'Thank God it's Friday' theme of Vintage in mind. 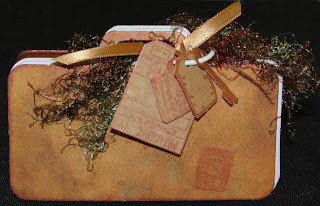 It is from Debbie's Die-cuts and I covered it with K&Co paper, inking the edges with Brilliance Cosmic Copper. 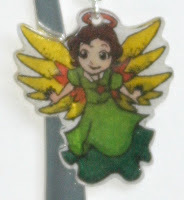 I used that to stamp (Inkadinkado's Travel Time) decoration on to the case and to create some charms from brown card. I used a 7 gypsies binding ring to hook everything together with some ribbon and fibres. Also using some of Debbie's die-cuts I made some favours/ tree decorations: The pyramids are stippled with luminescent paint that shines gold in the light (failed miserably in the photo!) and have Cuttlebug Ice Crystals stuck on. I dabbed Broken China Distress Ink inside the Swirls embossing folder before running the die-cut for the little box through. I love that technique but not sure why this ink pooled to spots? are still having their one-a-day giveway and guess who won yesterday? ME!!!! :) Sooooo happy! are still having their one-a-day-giveaway! 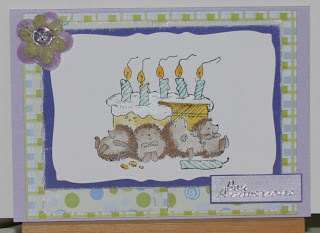 I made a birthday card earlier in the week the Sketch Saturday #25 layout and this card uses the same sketch. I changed it many times as I went along but quite like the tree as the upright piece: The angel seems to be escaping from the top of it! 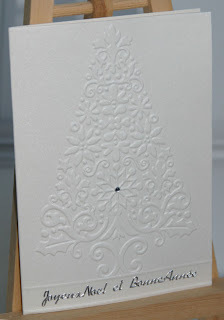 Used: Backing paper from my own Winter Collection designs, Whiff of Joy 'Angel Charlotte' (I think that's the right name) coloured with H2Os and mounted on 3D foam, handmade paper and die-cut tree and the card edged with Brilliance gold. 3 posts in 1 day! I'm exhausted! 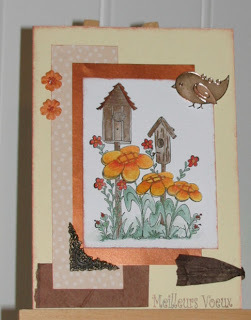 Friday's Daring Cardmakers challenge was to make a card featuring bird(s) and I followed Friday Sketchers' layout #28, provided by Mumur, to create this. I kept the background plain as there are lots of layers and details on the sketch so I didn't want to overload the card. The stamp is a large one so this is an A5 card. At least that gave me plenty of space to work with. I'm just not happy now about the raffia now: Might have to change that. Main image coloured with H2Os; bird peel-off coloured with markers, mounted on card and coloured with Distress Inks; other inking round edges and sentiment is Brilliance Cosmic Copper. I have had this Craft Robo file from the very talented Erika Philipson since last year but this is the first time I remember using it. I have made 2 today with similar insides but slightly different fronts. I like to keep the fronts quite simple if there's a surprise inside. 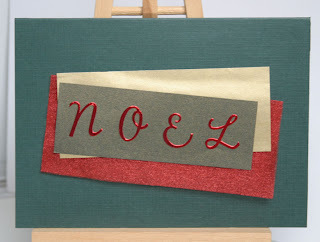 This one uses red organza fabric as a layer and NOEL is cut in red mirri card with the Cuttlebug Harmony alphabet. The 'wallpaper' inside is K&Co. Not my usual style but one thing I have learned in selling my cards to a wider market is that you have to create a wider range! 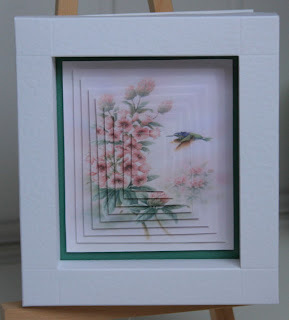 These decoupage sheets are from Diamond Craft with the framed card having been created on my Eazi-score board. The ASFoS challenge #25 is to make a card for a child so I used my new Alota 'Sassy with Kitty', which Gayle kindly sent me, coloured with distress inks, to make this card and also followed the Sketch Saturday #25 layout. I have Christmas Craft Fairs the next 3 weekends running so it was nice to do a non-Christmas card. On the otherhand, with time against me, I have had one of those afternoons where little has gone right: Ho Hum! Really like the sketch: May well use that again. 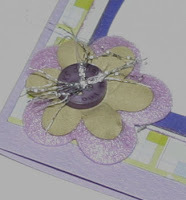 Janet has launched a new business on Pink Gem Designs with a range of stamps featuring a gorgeous character, Mimi. She has candy offered to celebrate and also special offers on the stamps and UK/International postage: Well worth a look! 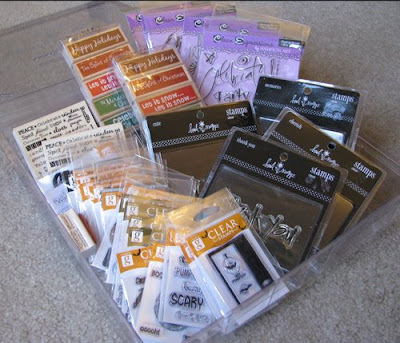 Bootiful Stampz have gone "slightly mad" and are having a 'Stamp a Day Giveaway': Yep, giving away a stamp a day as candy! 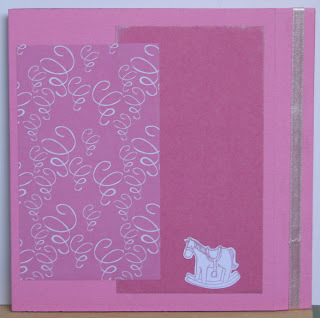 The Arty Girlz challenge was to use a blog as inspiration: Perfect time for me to take inspiration from Jennifer's Sweet Treats: I have wanted to create some cards with the Cuttlebug embossing as the main image, rather than just as background, which I think Jennifer does so well. 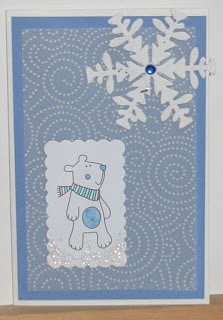 I have seen several cards on Jennifer's blog using the 'Winter House' embossing so here is my version. 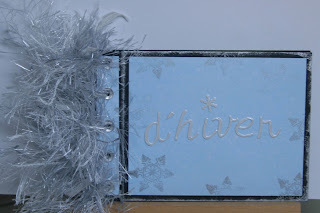 Not sure colours are clear in the photo: Card is pearlescent purple and the image is embossed in a pearlescent ice blue paper, highlighted with holographic glitter glue and matted on my own design paper from the Winter Collection and then silver paper. 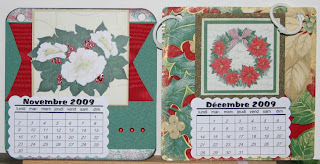 Here's a little experiment: a 'quick' calendar! 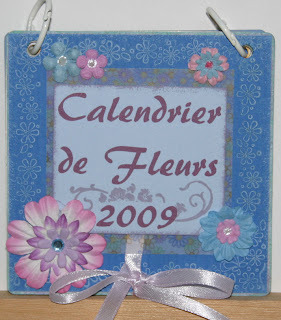 Unfortunately, even using Publisher to create the calendar, converting it to French and formatting it to fit my punch took ages. However, now I have it saved I know I can reproduce it quickly and easily. 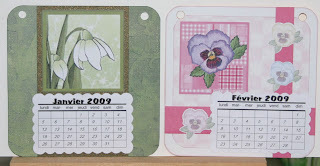 I used the flowers from Making Cards magazine Special (which I have as an online purchase) as the focal points and just mixed and matched papers and inks to suit. Happy accident: Quite a few of the backing bits are from accidentally printing the pages on economy setting so waste not! I need to find some jump rings from my stash though as these binding rings are too big. I shall probably now make more in a similar way and use the Bind-It-All to wire-bind: I don't know why I didn't do that in the first place! Incidentally, the ribbon holds it shut and also, if tied the opposite way, stops the open covers sliding apart and allows you to choose the angle you have the pages at: Worth including if you want to make something similar! 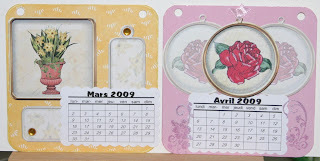 Voici mon calendrier « rapide » ! Malheureusement, à trouver un bien model pour mon perforatrice à couper a pris des âges. Cependant, maintenant je l'ai sauvegarde, je peux le reproduire rapidement et facilement. 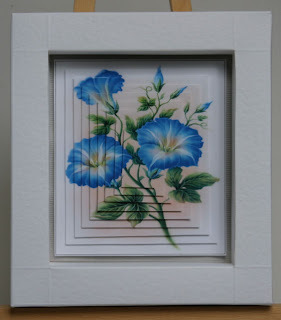 J'ai employé les images fleurées du ’Making Cards Floral Special’ (que j'ai acheté en ligne) comme les points focaux. Credits: Making Cards Magazine Floral Special; Papermania and K&Co papers; 7 Gypsies Binding Rings; SeeDs stamps; Dovecraft mega-size scalloped rectangle punch; Inks: Brilliance gold, Colorbox Q chalk 'Misty Meadow' and Distress 'marmalade'; prima and other paper flowers; Sakura glaze pens; Dylon 3D pearly paint; other papers, coaster covers, ribbon, etc from stash/unknown make. 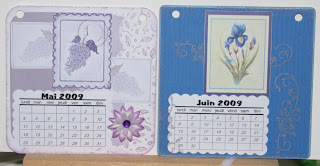 While off-line I created a few mini-albums as examples for a charity workshop I will be doing. The workshop will only be 2 hours and is aimed mainly at beginners with materials included so I have kept the examples quite simple. I had to convince myself that I could have a group following instructions, making and leaving with something they can feel pleased with inside 2 hours. 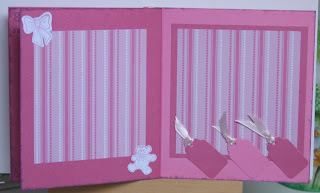 I want them to be able to choose shape, colour and theme while keeping the instructions basically the same for all: These are all either 12x12 or A4, cut, scored, decorated and then stuck together down the spine with DST. 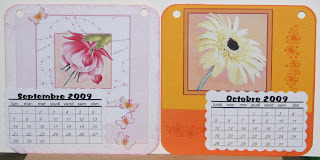 Main issue now is that these seem so sterile without photos and journaling so I think I will make a few in the same style with photos; equally I want people to feel they can make them for presents or add their photos and further decoration at home after the workshop. Without showing you every page, here is a selection. What do you think? 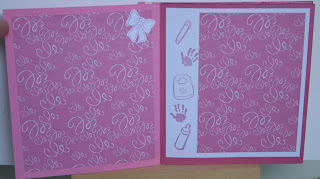 I am definitely more a card-maker than scrapper but mini-albums are more popular here than card-making. Any other suggestions ? Used: Cardstock mainly Papermania and The Paper Mill Shop; Papers are mainly Papermania, with some bits from Funky Fairy Papercrafts, Making Cards magazine and unknown make of green/blue spotty paper. 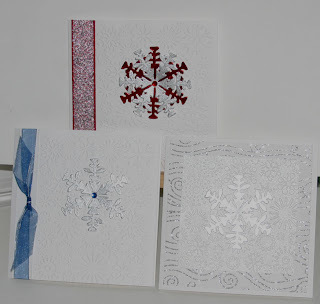 Also: Docrafts snowflake punch, Cuttlebug ice crystal and Harmony alphabet, Nestabilities Circles, Craft Creation snowflake border peel-off, Aladine Pram & Snowflake stamps, other baby stamps from SeeDs 'Cute Things' set, Brilliance inks, Diamond Craft large alphabet template set, ribbons and fibres from stash. What a lot of blogoversary's there are now! 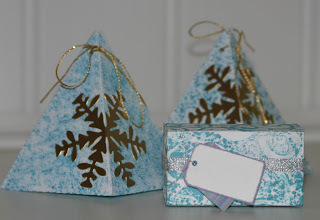 Claudia's Pretty Pressings is one of my fave blogs and she has 4 great candy prizes. Fran on Franmade is celebrating her blogoversary and over 55000 hits. And Anita on Papirrommet is also celebrating her blogoversary. Sheetload are having a 'Candy Blowout' and if ever there was a need to do 'sheetloads' of cards it has to be the run up to Christmas so if you haven't looked before I really recommend their blog and monthly ezine where they give a sketch, cutting templates and lots of examples to get the most out of your card and paper. The candy is also great and is all going to 4 lucky winners this month! I'm back ! J'ai revenu ! We had a bad storm pass overhead about 10 days ago which wiped out something electrical in most of the village: For us it was the modem! Nightmare, and first priority when the new box arrived had to be catching up on customer orders and restocking my eBay shop. Now I am ready to start catching up with some challenges and have just been blog-hopping. That means I have some candy alerts to share: Ann of Creative Antics has some Christmas candy; Desiree is celebrating 15000 hits and Bev of All the Things I Love has gorgeous Whiff of Joy candy to celebrate 50000 hits! and last but not least BIG thanks to Gayle of Little Bird Design: When we got back on-line I discovered I had won her generous blog candy which cheered me up massively amongst all the chaos!